I have been very slack in physical preparation for this walk. Last year I was running a few kms every day and spending the rest of the hour in the gym at work. This year I’ve been walking to and from work regularly (not anymore, today was my first weekday off!) but hiking has been sporadic. I am ramping it up a bit now and as part of that I walked along Great South Road today. It is a bad road to walk along. It’s busy, it’s dirty, and the pavement changes sides a couple of times. So strong were the fumes that by the time I reached Papatoetoe to see my grandparents I had felt like I was going to sneeze for the previous 30 minutes. It’s a nasty feeling and has really set me against thru-city walks in Japan. Not that I needed much convincing. I did see two things I liked though. Otahuhu is a fun suburb. Its section of GSR is busy with shops spilling out on the pavements selling vibrant pacific island style tshirts and jandles. 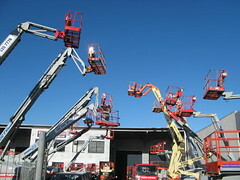 The other highlight was this interesting arrangment of cranes. I could imagine a bunch of people standing in each bucket shouting and gesticulating at each other. This afternoon I took the time to set up my Henry Shires Rainbow. 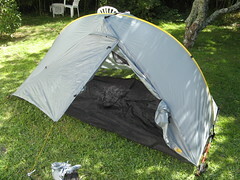 A 1 person tent weighing less than 1kg. I think I could easily fit a guest in there, though our bags would have to be used as pillows or left out to the elements. It certainly feels big inside, much bigger than the Big Agnes Seedhouse I carried last year and I’m looking forward to my first night in it. 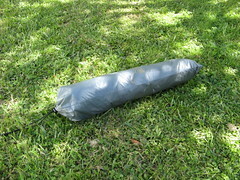 I’ve had the tent here for ages but I needed a dry day when I was at home to properly seam-seal it. I’ll apply another layer tomorrow too. p.s. I paid for it with the donations I’ve received via PayPal for little freeware software things I’ve released. So if you’re one of those kind souls that donated money I’m glad I can now show you that your money has been spent wisely. I also bought the 1-man rainbow, and haven’t sealed it yet. Would be intersting to read your opinion on it, after you have used it for a while. I dont envy your walk down the GSR ! I think you’ll find less pollution on Tokyo streets with their modern cars / public transport!